"Confession: It's important to note that I never read instruction manuals unless I'm totally clueless. As of today, I still haven't read an OS X manual (Apple's 'Argh' back at me?). But hey, should I need to read a manual? Isn't the point of OS X and all Apple products, in general, that they're dead easy to use? I thought so." "I was impressed by the speed of Tiger on this 400 MHz G3. 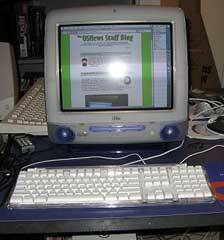 I remember a time in 2001 when our ex-housemate bought a 500 MHz iMac with Mac OS X 10.1.5. It crawled! But Apple has made an exceptional job optimizing Mac OS X since then. Especially with Panther and now with Tiger, a supported 400 MHz G3 is more than enough for some basic Internet usage (browsing, email, IM etc.)...." "Do you hate spam? I mean, hate it. With the passion of a thousand fiery suns. Would you, given the chance, obliterate it from the face of the earth? How about for a Klondike bar? Excellent. "Many of us probably have an old Mac lying around that could be sacrificed for this sort of duty, and it may very well be a meaningful sacrifice to stop the evil that is spam." "I've created this site because so many of the Macintosh users that I have encountered have expressed frustration that they don't know what to do, or what to use, for performing routine maintenance on their Macintosh running OS X. There is also a huge amount of misinformation going around on the subject. Even Apple has contributed to the confusion with conflicting tech notes on their Web site. With the assistance of a few free utility programs, routine maintenance under OS X is very easy. The problem for most users is figuring out which utility to use, and for what. This site will tell you that. "Just a little routine maintenance can be as effective as buying an expensive accelerator for some Macintoshes! It can also banish vexing spinning beachballs, rid you of 'out of memory' error messages, make an old Mac perform like a newer one, and keep your valuable data from being lost." Apple has posted a developer note for the new education-only iMac. "This developer note gives a technical description of the 17-inch iMac for education computer, based on the Intel Core Duo microprocessor and introduced in July 2006, to help developers design products compatible with these computers. The note provides information about the computer's internal design, input-output features, and expansion capabilities." PR: StorCase Technology, a world leader in data protective storage enclosures, today announced the release of a new InfoStation 5-Bay SATA desktop model with support for both PC and Macintosh systems. The latest version of this high-density RAID enclosure allows increased configuration flexibility for up to five removable SATA 3 Gbps drives, providing the performance, data protection and adaptability required for today's demanding and dynamic storage applications. The 5-Bay InfoStation integrates a SATA port multiplier that greatly simplifies cable management by allowing a single cable connection for up to five SATA devices. The versatile enclosure is capable of using all five bays for RAID levels 0, 1, 10 and JBOD, and uniquely supports twice the SATA-specified external cable length. This complete, turnkey solution incorporates a 64-Bit PCI-X 133 MHz HBA and includes a shielded 2-meter cable with standard eSATA external connectors. The new enclosure is PC and Mac OS- compatible; support for Linux is anticipated in the near future. "The 5-bay InfoStation now with Mac support is one of the first external SATA enclosures on the market that doesn't require bridging to a SCSI, Fibre or Ethernet host interface," stated Joel Tang, StorCase Director of Engineering. "StorCase is providing an efficient, reliable and platform- adaptable solution that supports up to 3.75 TB of storage within a single, cost-effective and compact enclosure," added Tang. For added application flexibility, two desktop InfoStation units can be mounted horizontally in a standard rack cabinet with the use of an available 3U rack mount kit. Exceeding hard drive and controller manufacturers' requirements for operation of high performance, high capacity devices, all StorCase enclosures are supported by industry-leading warranties and 24/7 technical phone support.